Today at Urban Hope, the worship service was led by the youth. It was an awesome experience to see so many young people share their faith with us in several different ways. One of the most moving experiences happened when a young woman shared her testimony of experiencing childhood trauma, how that trauma affected her life and almost brought her to end it. She closed her message with how God stepped in and redeemed her life for something so much better than she could have ever imagined. She lives for Christ now, completely. A couple hours later, I was standing under a rail road bridge talking to another woman who lives under that bridge with about forty other people. This woman is due to have a baby this fall. She said that she is drug-free and does get prenatal care on a properly scheduled basis. I congratulated her on making those decisions. She went on to say that she's barely surviving financially and works just enough to make ends meet in her life of residency under the bridge. I got brave and asked her what she does to earn a living. She explained to me that she is servicing only a very select few of her regular clients. She added that this hurts so much more than it used to because she no longer has the drugs in her to numb the emotional pain of what she's doing. My heart broke. Here is a woman made in the image of God just as much as the woman who gave her testimony in church two hours earlier. And yet here they are on two very different paths in life. What makes them different? What makes them exactly the same? God died for each one of them equally. God loves each one of them equally. One is fully aware or at least learning more and more about her Christian path. The other one has no idea of or a twisted idea of what that Christian path could be in her life. For the past several days, I've been reporting on Facebook that Mickey is missing. I've come to know how much love there is for this woman who has been calling the street "home" for something like four years. I wrote about those aspects of love for Mickey in my previous blog. In these past several days, I've been texted and called by caring strangers who have seen Mickey and described behaviors that I know to be hers. This morning's call was different. A woman called to say that she had seen Mickey near the Arby's on Aramingo which is reasonable. That's her typical path. I shared with this caller my observations of Mickey and how she is not your typical addict on the street. There's a small community of people who see the goodness in Mickey. None of us can, as of yet, coax this Feral kitten of a person - made in the image of God - into a better life. Mickey has a black eye and a bruised face! She's somewhere in the vicinity of Aramingo and Huntington, Lehigh, B Street and The Tracks. Her path may be widening and so keep looking. Don't look for a pathetic panhandler! Don't look for an addict! Don't look for a loser! Look for Mickey (or Kim)! Look for that young woman who could be your daughter, granddaughter, niece or neighbor! Mickey has virtually no one really looking out for her on a day-to-day basis. In some ways, that's true and that's dangerous. In other ways, it's far from true and that's the message of this blog. In the past three days, I've spent about 15 hours searching for Mickey. I've handed out fliers and posted in relevant groups on Facebook. I've asked other homeless people, sidewalk restaurant cooks, firemen, nurses, security guards, admissions personnel, and cashiers if they have any insights into where Mickey may be or when they've seen her last. When I first met Mickey, she was folded up within herself to the side of the entrance to the Wawa on Aramingo Ave. She sat there and asked people for any change that they could spare. 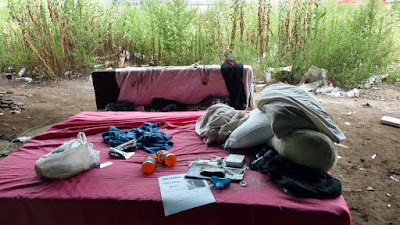 Her clothes were filthy with multiple days or weeks of grime and body sweat (and more) and her stench stank. Over these weeks, with the incredible help of someone who wants to remain anonymous, we began a clothing exchange for her where every two days, she washed up and changed into something fresh of her choosing since there were many options provided. I brought her dirty clothes home and washed them. When I took them back to her washed, dried and folded, she was noticeably shaken. She laughed with delight in realizing that someone cared enough to do that for her. "I care because Jesus loves you." has been my response. Mickey's responses to this and many interactions told me that there is something unique and special about Mickey. She began taking better care of herself and her fragrance was increasingly more along the lines of "Red Door." Janine is a woman who lives in a home near the Wawa. She looks after Mickey as best as she can. She and I agree that there is someone special trapped inside Mickey's heart. There is the woman on Huntington Avenue who has a sidewalk restaurant. When I asked her if she'd seen Mickey recently, she commented on how nice Mickey is as she walks to and from the Tracks. "She'll come to her senses some day. God will guide her to safety." was this woman's response. There's a woman who works at the carry out section of Applebees who has had some interaction with Mickey. She's going to call me the moment she sees her because she knows that no young woman should be on the streets alone. There is the friend from years ago who saw my post on facebook and told me that Mickey is "a nice girl. She's just lost and needs some guidance." There's the manager of the Exxon where Mickey has been asking for change more since Wawa Corporate decided to have guards chase "people like Mickey" away so as not to be an offense to customers. He's asked Mickey to leave on sevaral occasions but has promised me that if she reappears, he will call me and allow her to stay until I arrive. Wawa Corporate decided to kick Mickey and other homeless people off their property. They did not break the determination of one of their employees who has noticeably and boldly befriended Mickey as long as I've known her. Her name is "Jazz" or something like that and she gets a gold star from me for her help in providing the best lead today as to where Mickey may be!!! And here's where God's obvious presence was in this story today. I thanked Jazz and I drove to __________ __________, twenty minutes away. I explained this whole story to the receptionist and she was very helpful - as much as she could be due to privacy rules. "I can not deny or verify that Mickey is here at __________ __________. "May I pretend that she is here and write her a letter for you to pass on to whoever should get it?" I asked. "That's fine." was her response. And so I wrote a letter to Mickey and gave it to the receptionist at the front desk of __________ __________. She did suggest that I fill out a missing person's report so that the police can investigate where Mickey may be and let me know. I went on to file a missing person's report only to be told that I did not have enough accurate information to file an official report. 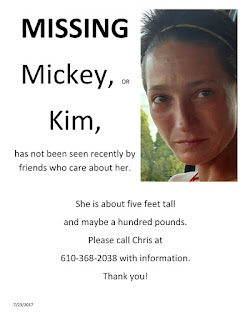 The officer did say that they can maintain an extra awareness of Mickey and encourage her to call me if they see her. Mickey may be at __________ __________ or she might not be. She might receive my letter and choose to or not to respond. Those are big variables, too big for my comfort. And so, the search continues. This is a search for Mickey and any information that helps us to move forward with finding her. I'd like to write more but I need to prepare for my morning appointment with my service business that is funding this ministry. This is my first attempt at voice texting a Blog. I hope the words on the screen will be the words that I said. I will do my best to review the written content. I went into Philadelphia today and up to my now favorite Wawa store on Aramingo Avenue. Almost immediately I found Mike. Mike is approximately my age, maybe a little bit older. As I've already told you he's a professional welder and according to his own testimony rather skilled in various forms of home and building construction. We started chatting for a while in my car and he volunteered some interesting information. Prior to being homeless he was living with his adult daughter and her family in Garnet Valley Pennsylvania. For those of you who don't know, the town and zip code of Garnet Valley is a fairly new phenomenon. I won't bore you with the details other than to point out that Garnet Valley is basically where I live. And so, this man who I have been getting to know for the past 5 weeks or so was fairly recently, let's say 6 weeks and earlier, more or less, my neighbor. He went so far as to give me his daughter's home address and her name. Now let's stop to think about this a little bit. Of all the people I could be getting to know as I am involved in this homeless Ministry, one person who I'm getting to know has lived extremely close to me until becoming homeless. I'm not sure where this particular storyline is going to go but I find it interesting. As much as is appropriate and without breaking confidences, I will share the story with you. After visiting with Mike for about an hour as he sat in my car and enjoyed the air conditioning on this extremely hot day, I set out to find Mickey. Four hours later with some Bible reading and driving around her normal path I returned home having not seen her so much as one time. This is reason for concern because that is not her pattern at all. She has been one of the more easy people to find hence all the stories that I have about her. So if you are reading this through the night prior to me getting up there in the morning to keep looking for her, I'd greatly appreciate it if you would say a prayer or two or three or even four for her and my search to find her. I do pray that she is safe. There was one moment in my search for Mickey that I thought I had found her. It was when I rounded the corner onto the bridge on B Street. This is the bridge that goes over the tracks section of Kensington. As I've mentioned in earlier blogs, "the tracks" are the most devastating region in and Kensington for the current drug pandemic. As I rounded the corner I saw who I thought was Mickey standing on a Ledge about 3 ft above the sidewalk and dangling there, not in a hanging from the neck kind of way but in a leaning very far forward extremely wasted kind of way. I pulled up to her and called "Mickey Mickey it's Chris get down please." She was completely incoherent and so I pulled the car over to the curb on the bridge and got out. And so here I was directly above the tracks getting out to help Mickey who turned out not to be Mickey but another woman approximately the same size and approximately the same if not more malnourished than Mickey completely wasted and incoherent but standing. As I said, she was standing on the three foot tall ledge that separates the road from the sidewalk on that bridge. I tried to get her attention to guide her down but was unsuccessful. At that same moment a young couple was walking across the bridge and they helped to guide this young woman, a child of God, to relative safety on the sidewalk where she continued her stand and incoherence. I've seen this same pose before on different people in the few months that I have been doing this. They just stand there and some of them are leaning way over without actually falling to the ground. For some odd reason we knew that she would be essentially safe as long as she stayed on the sidewalk. The young couple and I went our own way. About an hour later I made my rounds again as I was trying to find Mickey and I wondered what I would find when I rounded that corner up onto the bridge again. And there was the woman very responsive and walking across the crosswalk of the road just north of the bridge. A man standing on the Street corner gave me a very suspicious look which told me this should probably be my last pass on that road for the day. I would certainly never want to Typecast anyone but men standing on Corners in that area are typically drug dealers. I made my way back to the area of the Wawa store and just parked for a while in hopes that Mickey would find her way to me rather than me trying to find her. I never did find her. As I said before, this is very unusual and it is reason for concern. I will do all I can to find her in the morning and if I cannot, I will start asking people who may know. If I am not successful, I will probably file a missing persons report. It needs to be understood at this point that as far as I know Mickey has virtually no one really looking out for her on a day-to-day basis. While I would never hope this to be true, in theory she could be one of those people who disappears never ever to be seen or heard from again. I thought of my Dad's quote today at Urban Hope when Omar presented a digital welding mask to Mike. Mike has been homeless for the past two or three weeks. Life fell apart for NON-drug related reasons. He has been living under a tree behind a drug store all this time. He's been carting his few personal items with him whenever he walks away from that tree. Mike is a professional welder. Among his personal supplies was a digital welding mask, an expensive and vital tool for a welder. Last Thursday, it was stolen from him when his back was turned. With a possible welding job interview in a couple of days, not having this welding mask could break any possibilities of getting this desperately needed job. When I saw Mike on Thursday night, he was angry at the world and thinking there was no point in trying to get life fixed. He mentioned to me having the mask stolen. I texted Omar, a man at Urban Hope who would know what to do to find a new mask. Within a couple hours, a mask had been found on line for Mike, a man who had never entered Urban Hope but who has entered our community. Mike agreed to go with me to Urban Hope for church to get the mask. As a diehard Roman Catholic man, he promised me that he would not be influenced by the differences between his church traditions that he holds dear and what he was about to expreience at Urban Hope. He did his best to maintain his composure in a worship environment that was significantly different than his own. He was greeted warmly and with Christ's love by many men and women who were clearly glad he was there. After the worship service, Omar presented the mask to Mike and all defenses within Mike melted away. This hardened south Philly construction worker (Did I mention professional welder?) warmed up to so many people when he sensed something going right in his life for the first time in weeks - maybe months or years. 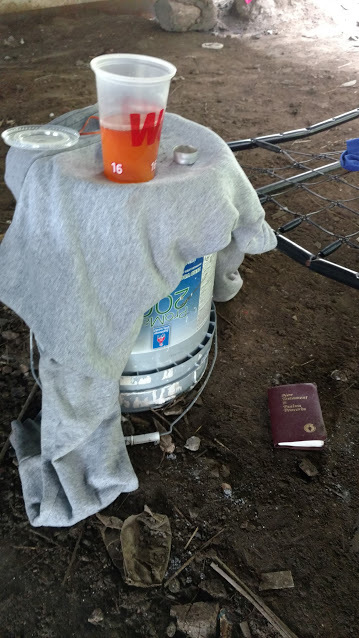 He was so moved by what was happening that he requested a Bible of his own (large print). Urban Hope, through prayer, seeks to meet the real and essential needs of the people coming into its community. Dad would be proud!!! as they try to survive. and the path to what could have been is widening. I've learned to see a person. and has no boyfriend or husband"
want to "help" for their own warped reasons. on hosting Kentucky Derby Parties? Exchange for sparkle, glitz and glitter? You will never meet her! How do I convey to you, my reader, the depth of human and Godly interaction of this weekend of Homeless ministry in a concise and yet thorough way? At some point in Mickey's past, she dared to visit a church and was yelled at according to her own testimony. She vowed never to go back to any church ever again and has made it clear to me that she will never go to any of my church activities. With a sense of paranoia on her face and struggling to navigate the ground under her feet, she stepped to the back of my van. I had to take her hand and guide her to sit on my back bumper where she composed herself enough to walk one block to meet people at the church as they set up for a block party. We walked down the sidewalk toward the church. We walked arm in arm due to her recent onset of instability. The first person to meet us at the corner of A and East Tioga was Jason Holt, the senior pastor (although they don't use that term). Ashley and others greeted Mickey with the warmth of Christ's unconditional love. Having never met Mickey before, they might not have picked up on her current condition. This morning, when I saw Mickey at the Wawa on Aramingo, among other things that we talked about, I asked her what she thought of Urban Hope. Even though stoned in the moment, she knew what had happened. "Yes. Ashley gave you lunch." Each time I head toward Kensington, I'm never sure who I'll find of the several homeless addicted people I've come to know. Some, with whom I 've had significant conversations, seem to have moved on. Ian now has a job. Gina, I think, is in some form of a recovery program. Mike is, well, I'm not sure. David and Autumn are professionals at being homeless and addicted and so I've backed off on "helping" them. I do keep in touch with them as able. And then there are the countless mostly younger men who do what they can to earn a legitimate income by opening doors at stores or washing windows on cars. That leaves Mickey and it is from her that I'm learning a great deal. I went to Kensington early Thursday afternoon, arriving at about 2:30 pm. This left 4.5 hours until the Faith Based Recovery meeting to which I hope to take a person or two. Unlike other times when I've taken Mickey to get something to eat, this time we went inside, ordered from the counter, received our order, went to a table and had dinner together. She had a two piece chicken dinner with macaroni and cheese plus a Cajun rice with added brown gravy. I had a three-piece chicken strip dinner with mashed potatoes and gravy. My drink was a vanilla Bark's Root Beer and Mickey's was an iced tea. She sat directly across from me at a table designed for four people. I want you to understand that this dining experience could have been had by you and your child, date, spouse, platonic friend, your sports buddy or any socially accepted combination of two people. In our case, it was between a typically socially unacceptable combination of me and a triple addicted homeless 29-year-old woman who has been living on the street for four years. We had a reasonable conversation and equally enjoyed moments of silence just as any combination of two people would have during a regular meal together. Afterward, we went to Walmart where Mickey found a nice pink-faced watch, a six-pack of women's rings and some smell good spray for her hair plus some cream for her aching feet. The total bill was not even $20.00. Mickey showed great restraint and courtesy in not spending more than what was needed for a few nice items that helped her feel better about herself. Mickey, just like every person you see on a street corner or at a store "panhandling" for money, is a human being who very much wants life to be "normal." This was made even more evident in Mickey's expressions of joy and the life in her eyes as we wrestled to unbind her new watch from its casing and the rings from their cardboard prison. Once that was done, she primped herself up with her new spray as she straightened her short hair while looking into the mirror that is attached to the passenger side sun visor of my van. Again, I share these details with you to help you see that all of these activities are such that anyone would do if they were there to do them. There's nothing abnormal in any of it. I was so taken by the normality of Mickey's actions and the joy in her eyes and expression that I commented to her. "I don't understand why you're living on the street." Everything you're doing is totally normal and reasonable. You have life in your eyes unlike some homeless and addicted people I've come to know." She smiled and said, "Thank you." Between each of these places, we parked in the corresponding parking lot and listened to the radio and chatted for a short time. Mickey seemed to greatly appreciate the opportunity to just be herself and not the frightened homeless person that she is as she wanders alone from store to store in hopes of being tossed a quarter. And that's another thing about Mickey. On two occasions as we entered or exited stores, SHE WAS ASKED BY A HOMELESS PERSON standing outside the store and who she did not know if she had some change. In both cases, she approached that person and placed her own quarter directly into their hand being sure to close that person's fingers around that quarter. I was stunned by her gentle and caring thoughtfulness. As I type this, I can't help but be reminded that we often minister to others most successfully out of our own brokenness. Mickey knows what it is like to have change thrown at her and hit her in the face. I've seen it happen to her. Mickey is not about to have that happen to any homeless person for whom she can provide a coin. Toward the end of our time together, we pulled into a large shopping center parking lot and parked off to one side. Mickey looked through the selection of clothes that I had available for her and she changed into them in my van while I took a short walk. She felt respected and trusted; respected that I didn't stay in the van and trusted that I allowed her to be in my running van alone. Again, while a bit unusual - OK... a lot unusual to use my van as a changing room - this moment gave Mickey dignity as compared to the guard at Wawa following her through the store each time she dares to walk in. Four hours after this time with Mickey started, I invited her to come to the recovery meeting at 7 pm. She declined with a smile and a hint that some other day might work and so off I went. The meeting turned out to be a Memorial service for one of the founding members of the group who had overdosed earlier in the week. I was shaken by that. On my way out of town, I stopped to see if Mickey or any of my regulars were at the Wawa. Mickey was in the back parking lot, standing there and looking lost and alone. I asked her if she needed anything to eat and she said no but asked for a sweet tea. I got it and an ice cream for myself. I love my evening ice cream. I came out and told her about the memorial service and how sad it was. I told her not to die from her drugs and that I'd be sad if she overdosed. She looked at me with a sense of - well - I'm not sure. It was as if she'd never thought that anyone could care enough to say such a thing to her. All of the natural and normal behaviors within our interactions of that day as I have just described were counterbalanced by the most unnatural behavior of all for that day. It was that moment when I said goodnight and left Mickey standing alone in the relative darkness and dampness of that night in the back parking lot knowing that she would have no indoors to call her own. Of the ten to twelve homeless and addicted men and women, I've been getting to know, I've seen a pattern with most of them. David and Autumn, for example, have been on the streets so long that to call them homeless, I'm not sure is correct. The streets are their home. They have a system for sleeping behind this dumpster or that bush. They go to work on this street corner or that avenue intersection depending on their knowledge of the flow of traffic for that particular hour. They are known by locals and get food, clothes, and money from passers-by and some who stop to converse. There are others, too many to count and name, who offer a service such as the doorman at Wawa or the window washer who circulates among several shopping center parking lots. There are others who stroll about with a shopping cart or wagon and collect metal things to take to the metal thing place (shows how much I know) for redemption into cash for their life and habit. And then there is Mickey. Mickey sits and waits for someone to give her change. When she's not high, she can carry on a reasonable conversation. Once she's gathered $10.00, she walks several blocks to make her next drug purchase near the tracks. She walks back high to where she sits and waits for her next $10.00 interval of change. When she's high, she's quiet and offers very limited conversation - going so far as to tell me she's high and can't talk now. Readers of this blog series will know that I've distributed sandwiches with Mickey one Sunday and taken her to Episcopal Hospital where they gave her Narcan due to a mild case of overdose the following Sunday. I saw Mickey borderline unconscious that second Sunday and beyond exhausted on several other days. Mickey has shared with me how frightened and alone she feels out on the streets and yet is not ready to make changes. I saw Mickey last Sunday. She was fully communicative so I knew she was not high. She told me that she had not slept at all in a couple days. She looked exhausted as any human being would with such an extreme lack of sleep. I told her that I had some clothes and supplies for her that she might want. We walked to the back of my Uplander where these items were as I was parked under the watchful eye of Rite Aid's security camera. Mickey sat on the bumper of the open hatch and started looking through the things I had for her (and others). Sleep was quickly overtaking her. She asked if she could just close her eyes for a bit. I agreed and she leaned back on the back floor of my minivan. "While you're resting Mickey, I'd like you to listen to a song on YouTube." "Okay," she said. I pulled up Natalie Grant's song "Clean" and began to play it for Mickey. A hint of quivering chin and a drop of tear began just before Mickey's face relaxed into the sleep of utter exhaustion. It all started the day I first attended Urban Hope. I didn’t know that attending a Christian concert one night last September would lead me to do this. One thing led to another and now I’m living to experience a high the likes of which I’ve never known. I’ve come to know and care about several homeless addicted people. I’ve walked the tracks and prayed with a man and woman who I had just watched shoot up with heroin. I’ve walked right through active drug transactions and been very properly greeted by dealers and buyers alike as they paused their transaction out of respect for Urban Hope’s green shirt that I wear with humble pride. I’ve given away countless granola bars and Urban Hope schedules as a way to start conversations with homeless and addicted people I meet on the street. I took that same woman a week later to Episcopal Hospital as she was experiencing a touch of overdose from her last hit of heroin. I’ve seen the chin quiver and the tears flow from that same woman who watched Rick’s video and heard me explain God’s love for her. I listened to a grown man cry like a baby when his Mom visited him on the streets and reamed him out for wasting his life as a homeless addict. I was greeted by that same man who recognized me from the granola bar I handed him a month later and broke out with the greatest smile as he told me he was starting work the next Monday. I saw that same man a couple weeks after that happily riding a bicycle presumably heading to or from work. I’ve had a great laugh with a Lady Philadelphia Police Sergeant and an addicted woman when the woman put the sergeant’s bra (pulled from a bag of the sergeant’s donated clothes) on her head like an Easter bonnet. I was scolded by another Philadelphia Police officer who thought I was supporting an addict’s habit. When I explained what I was actually doing, the officer apologized to me. He went on to express his thanks for my efforts and his care and concern for this addicted person with whom I was about to have lunch. I’ve attended a Faith Based recovery group and heard the otherwise unknown and private stories of absolute heartbreak and how those true stories led these individuals to their drug of choice and ultimately to how our LORD redeemed them. I’ve held the hands of broken men and women with the intent of praying for them and having the tables turned when they began to pray for me. I’ve started carrying Narcan and almost used it three times in my first week of having it. I’ve handed donated clothes to some of these people and seen the relief on their face as they’ve changed out of their clothes worn literally non-stop for a week or more. I’ve seen horrendously blistered feet and eaten pepperoni pizza, cheese burgers and ice cream and shared God in the stench of unchecked body odor. I’ve boldly explained to two store managers that when a particular homeless person is with me in that store, he or she will be welcome in that store. The managers have never argued the point. This is my “high.” Like the people who sit in front of the store door or stand on the street corner asking you for change which almost guaranteed, THEY WILL USE to buy their next hit of the drug of their choice, I’m asking you to consider supporting me in my "habit". My "drug of choice" is the Christ filled joy of looking into the eyes of these broken children of God and inviting them to tell me their story, to listen with God’s unconditional love as they share their story and to seek to plant seeds of Faith and Hope into their soul during whatever time of interaction I may have with them. This is based on 1 Corinthians 3:6 New Living Translation (NLT). I would love to be involved in this ministry far more than I am right now. To do so, I need your prayer and financial support. If you would like to support me in either or both of these ways, please let me know. Prayer is my biggest need for out of it all other resources will be available as truly needed. You can ask me to serve you through my service business, Your Helpful Neighbor. 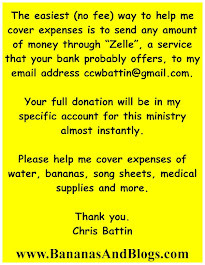 After all, the more income I have coming in through it, the more ministry I can do. You can mail a check to me at PO Box 21, Chester Heights, Pa. 19017. If you would like to financially contribute through a 501c3 for the tax deduction I hope to have something set up soon. Please let me know of your interest along those lines. My contact information in on my web site. In fairness, there are the exceptions of non-addicted people who are homeless due to other circumstances. For a few weeks now, I had been telling my life long friend Dolly Rea about my efforts with the homeless addicted people of Kensington. Dolly is a retired R.N. and has a giant heart for people. She loves to give good things to others. Without asking Dolly to do so, she gathered together clothes and shoes and shampoos and more for me to distribute as able to the various people I'm getting to know. On my way, I stopped at the Wawa on Aramingo Avenue. There was something different this time. There were less homeless folks than normal. In fact, I didn't see any. I saw a security guard and knew things were changing. I drove around the store and when I got between the Wawa and the Rite Aid, there was Mickey sitting on the curb out of authority range of the guard. I sat on the curb with her for a bit and asked if she was hungry. She said that she'd not eaten all day and had no money. "Let's go in and get something," I suggested. We did. The guard walked around behind us never taking his eyes off of Mickey's actions. I turned to him and said politely. "She's with me." Mickey ordered from the deli and picked out some other decent food as did I and we went to the register. The whole time, she (or we) were under direct surveillance. We went to my car where we ate dinner together in its air conditioning. It was a hot day and Mickey appreciated the moment to sit in some cool air and eat. I hear the words "Thank you." from Mickey a lot. Whenever I'm with Mickey or any of the other people on the streets I'm getting to know, I do what I can to bring our LORD into the conversation. Mickey is very resistant to this. She told me that at some point, she went to a church and they yelled at her. She has never gone back to any church since that. I brought God into our dinner there in the front seat by simply saying, "Thank You, LORD, for our food." and left it at that. As we ate, Mickey shared briefly that she's frightened and alone. She wants to go back to Atlantic City where she has friends (or family). "Would they welcome you back?" I asked. She wasn't sure. I suggested that we call the people to get their thoughts on her coming to them. She didn't have phone numbers and would not tell me names to look up. I suggested that she come with me to the recovery meeting that I was heading to in a few minutes. Someone there could give her ideas on how to appropriately contact these friends in Atlantic City. She wasn't interested because the meeting is at a church. BOOTS in Mickey's size and SOCKS! I was so shocked that I called Dolly right away. When she answered the phone, I explained what had just happened. Mickey expressed her appreciation directly to Dolly through tears as she reiterated how frightened and alone she feels. The three of us talked for a couple minutes. Dolly was great with her unconditional love for Mickey and called her "Kiddo" a couple of times which Mickey seemed to like. Mickey thanked Dolly several times during that brief call. I did my best to convey to Mickey that she's loved by God and the provision of these boots and socks as she'd requested before WE knew they were there is evidence of that love. "Really?" she asked. "Yes. really." Again, I left it at that. Thinking that this experience might have softened Mickey's heart, I invited her one more time to come to the recovery meeting. She wasn't interested. We said goodbye and I made my way there. I arrived a bit late and slipped in as unnoticed as I could while Brenda was gloriously singing. Rick provided a powerful message for the evening. I don't normally speak at these meetings but this time I did as I shared with the group very briefly what I've just written at more length above. Brenda and others agreed that this was a God moment for Mickey whether she saw it as such or not. "Keep pouring yourself into her." was my encouragement from the group. I'm making it a point to see as many of these homeless people with whom I have some degree of ministry going about every two days. With the Fourth of July Schedule rearranging my typical pattern, I decided to go up Friday and see who I could see. The "doorman" at Wawa and the man who washes car windows for a dollar are gone from Wawa now that there's a guard. David and Autumn were working at a local intersection and too busy to talk. Gina is in Rehab (I think.). Ian is now working. But there was Mickey - on the curb out of authority range of the guard. She looked exhausted. I sat down next to her and she said she'd barely slept since I saw her the evening before. Nor had she eaten anything significant. I'll write more about the details of this evening later. Here's a summary. She sat in my passenger seat as we went to Wendy's at her request for a burger. Before we got there, she was sound asleep. I sensed this was the sleep of any human being that had not slept well in the past 24 or more hours. I pulled into the Rite Aid Parking Lot and parked near a security camera (as I always try to do) across from Wendy's and let Mickey sleep for about an hour while I read my Bible and prayed for her and my ministry efforts. We made our way to Wendy's where we each had a burger, fries and iced tea. Our conversation included her thoughts on Atlantic City, being frightened, alone and tired of this lifestyle and not liking church.... Sprinkled throughout were my attempts at pointing Mickey toward an understanding that God loves her. "I'm doing these things for you, Mickey, because I care and Jesus loves and adores you." I even tried to sing "Jesus Love Me." Mickey turned up the radio... I laughed.